AdaptiveBlue’s GetGlue.com is a check-in based social media service. Rather than checking into a physical venue like with Foursquare or Gowalla, GetGlue users check into entertainment media like TV shows, movies, books, music, magazines, Web pages, foods, beverages, video games etc. Instead of badges, they win stickers. And these aren’t just virtual stickers either. When you accumulate seven stickers, GetGlue will mail them to you as actual physical stickers to plaster on your laptop, refrigerator or whatever. 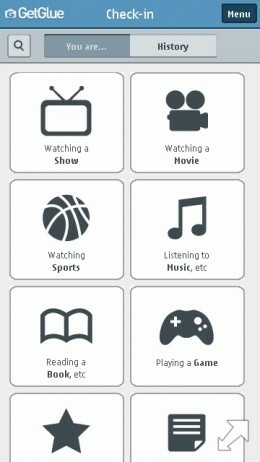 GetGlue users can check-in using Android, iOS or BlackBerry apps or with GetGlue’s Website or mobile Webapp. They can rate the media they check into, share check-ins on Facebook and Twitter and get discounts and special offers from GetGlue’s media partners which include HBO, AMC, Disney, MTV, the Food Chanel, Sony Entertainment, Simon and Schuster, Universal Pictures and many more. GetGlue makes the bold claim that its mobile Webapp at m.getglue.com lets you “easily check-in from any phone” so I put it to the acid test and tried it with the Synbian^3, browser, Opera Mini 6.1 and the Myriad V7 WAP browser on a low end feature phone. GetGlue looked great and worked well with the Symbian browser. The screenshots show the process of checking-in to a song or album; you chose a category (music), search for media (an artist) and check-in. You can add a comment when checking-in as well as rate, “like” or “dislike” the the artist and/or write a review. GetGlue is a fun service if you have a compatible device. It’s reportedly growing rapidly and AdaptiveBlue has been able to monitize the service with affilate marketing deals that give it a share of the revenue when you buy a book, movie or other media through GetGlue. 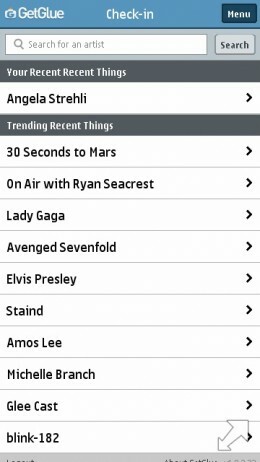 Entertainment check ins and GetGlue are hot items at the moment and could well be the next big thing in social media. GetGlue is the current market leader in this niche. To cement their leadership position, GetGlue needs to follow the example of Facebook, Twitter and Google Plus and ensure that as many mobile users as possible are able to use the service. To their credit, they have released a GetGlue API that looks to have everything necessary for any developer to build a more cross-platform GetGlue mobile WebApp. This entry was posted in Mobile Social and tagged Check-in, Entertainment, GetGlue by Dennis Bournique. Bookmark the permalink.